Happy Thursday! Today I’m sharing another father’s day card. This time it’s for my brother-in-law from my niece and nephew. Paul enjoys a good bbq so I thought this image was ideal for him! 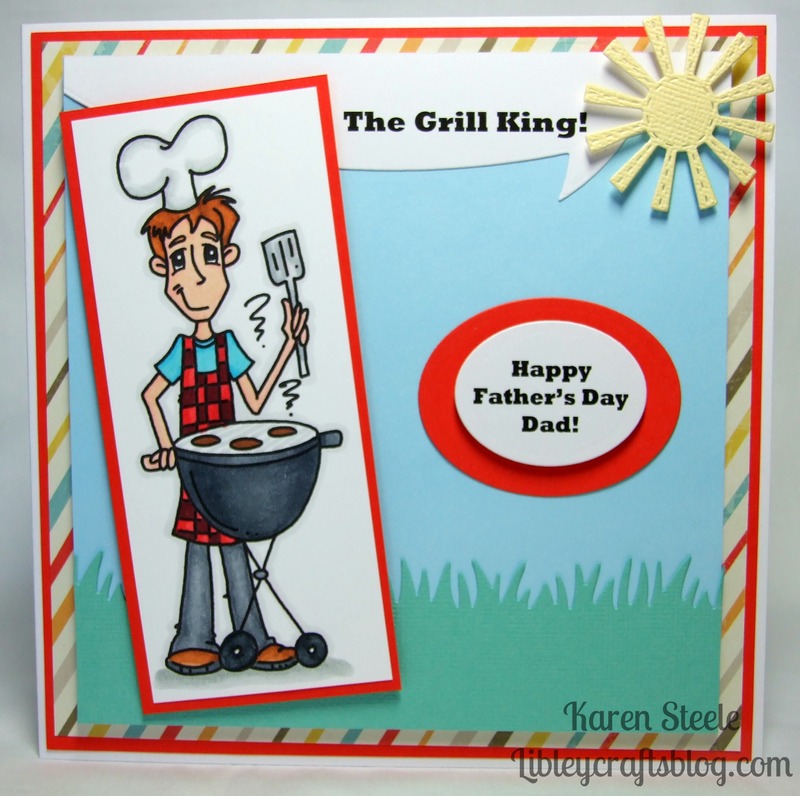 It’s called Guy – BBQ and is from Bugaboo Stamps! As I’m writing this, the sun is shining so I hope there will be lots of opportunities for a good bbq this summer – then again, I am in the UK! To make this card I also used a L’il Inker Sun Die, Lawn Fawn – Speech Bubble Border Die, Spellbinder’s Oval Dies, Lawn Fawn – Grassy Border Die, Spectrum Noirs, red cardstock, green American Crafts cardstock, blue paper from stash and the striped paper is from My Mind’s Eye – Boy Crazy. Great Father’s Day card! Love the fun grill master image! Wonderful Father’s Day card with the image and sentiments! Your brother-in-law will love it! That is a lovely sunny card! I am wondering though, you seem to make cards for all your family to give to each other, so who makes cards for you??! Great – I love the “Grill King” sentiment – you are just too good. It takes all I have to make cards for me to send but you are so generous in making cards for others!